The present study investigates the sensitivity of the Ovako Working Posture Analyzing System (OWAS) and European Standard 1005-4 for an assessment of work load of static working postures. Therefore a comparison of these methods with surface electromyography (EMG) is conducted. For this purpose muscle activity of eight muscles is captured in a laboratory study (n = 24) during 16 different static working postures. The results are compared with risk assessment categories of OWAS and European Standard 1005-4. A repeated–measures analysis of variance revealed a significant increase of muscle activity with increasing back angles and shoulder angles. However, this increase of muscle activity and the associated increase of musculoskeletal injury risk are not represented by OWAS and European Standard 1005-4 to the same extent. 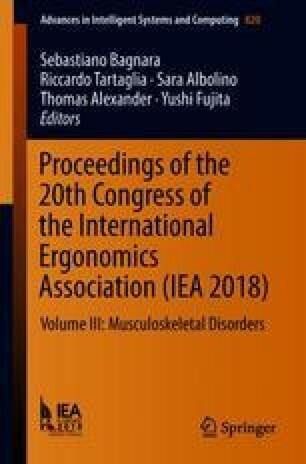 Thus, for an investigation of static working postures European Standard 1005-4 is more recommendable to identify musculoskeletal injury risk, since the high variance of muscle activity in the investigated working postures is represented better by the spread of three zones of European Standard 1005-4. The research is carried out within the “Smart and Adaptive Interfaces for INCLUSIVE Work Environment” project, funded by the European Union’s Horizon 2020 Research and Innovation Program under Grant Agreement N723373. The authors would like to express their gratitude for the support given.